Amazon's data division Amazon Web Services (AWS) has launched a new cloud-based backup and archiving solution that it claims offers "a secure, reliable and extremely low cost storage solution." The Amazon Glacier solution is designed for data that is infrequently accessed, yet still important to retain for future reference. Examples include digital media archives, long-term database backups, and data that must be retained for regulatory compliance. Data storage with Glacier can be had from as little as $0.011/Gb/month and there are no start-up costs with Glacier, no minimum or maximum storage limits, and users only pay for what they use. Amazon Web Services quotes an average annual durability of 99.999999999% for each item stored, and the service automatically replicates all data across multiple facilities, with regular data integrity checks and automatic repairs if hardware failure or data corruption is discovered. 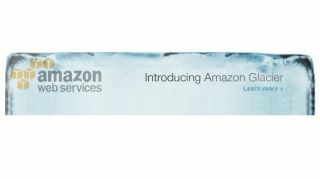 Amazon Glacier is available now in Europe using AWS' data centre in Ireland and is also available in four other Regions around the world (US-East (N. Virginia), US-West (N. California), US-West (Oregon), Asia Pacific (Tokyo)). While storage is cheap there are other additional charges for transferring data out of storage – there's no charge to place data in to Glacier – and for data transfer requests. The first 1Gb is free but charges increase on a sliding scale, starting at $0.120 per Gb with data requests charged at $0.055 per 1,000 requests. "Today, most businesses rely on expensive, brittle, and inflexible tape for their archiving solution," said Alyssa Henry, Vice President of AWS Storage Services. "This approach requires expensive upfront payments, is difficult to operate and maintain, and leads to wasted capacity and money. Amazon Glacier changes the game for companies requiring archiving and backup solutions because you pay nothing upfront, pay a very low price for storage, are able to scale up and down whenever needed, and AWS handles all of the operational heavy lifting required to do data retention well."